I keep having to come back to this episode of Inquiring Minds. I keep having to refer back to it over and over in conversation because people just want to believe that living better will keep you from getting cancer. I get so much pushback from people who want to believe that this or that strategy will keep them from getting cancer that I’m going to backdate the episode to the the blog with some descriptive text that didn’t get pulled out in the blurb, but does state the point I keep having to make. Paraphrasing the pertinent quote from this episode If you live long enough you will eventually get cancer. The errors in cell replication that lead to cancer are the same errors that allow for genetic diversity. We get cancer because evolution occurs even within our own bodies, and most evolution produces bad outcomes. Cancer is definitely not the result of poor diet or GMO foods. Cancer is a natural process gone horribly wrong, a side effect of living so long that the evolutionary process takes place inside your body. For those of you who deny evolution, think of this as payback from mother nature for doubting that her mechanisms exist. Mutation is how we got from single celled organisms to humans in 3.8 billion years. Mutation which frequently shows up as cancer in the individual. Them’s the breaks. Just got done listening to Common Sense 172. I generally agree with Dan on a lot of things. This is one time I think there’s more threat here than he’s willing to admit to. I’m not suggesting that Dan is a creationist, or even a christian. What I am suggesting is that the arguments of the Religious Reich (and I’ve heard this exact phrase come out of ID defenders mouths before) have seeped into the common arguments presented by average people who don’t necessarily understand what scientists mean when they use the word theory. Gravitational theory is only a theory too. But I wouldn’t suggest you jump off a building and expect to float. There is every bit as much science backing evolution as there is gravitation. Perhaps more. Dan has gone on the attack against science in the past (episode 5 for those with the DVD) albeit attacking pop science. And yet the scientific method is the only method that has been shown to be capable of determining what truth is. Science is under attack here in Texas, more than history is. The SBOE has specifically gone on the attack against the scientific method itself, attempting to undercut the basis for our technological society. The stories coming out about the history textbooks just highlight what kind of mental neanderthals are serving on the SBOE, and what their real goals are. Excuse me if I don’t buy McLeroy’s arguments on the subject of the skewing of academia. His past support for inclusion of the teaching of creationism in science classrooms (which is distinctly NOT science) and his boards attempts to manipulate the definition of the scientific method so that Intelligent Design would meet the criteria, have shown that he is no friend of education, or our technologically based society either (which only exists because of the scientific method) which makes me question the justification for his chairing the board that dictates what Texas children will be taught in coming years. The one thing I do agree with Dan on, on this subject, is the legitimacy of the existence of these types of boards in the first place. There isn’t any. They should all be disbanded, and the controls for what is taught should be handed back to the teachers and parents. The people directly involved in educating the children. Because, trust me, education begins at home. No matter what the government schools set out to teach my children, they get an education in critical thinking from me. I seem to have started an interesting thread over at the Common Sense forum. Still think Dan didn’t hit the SBOE hard enough. Jon Stewart did. I’d like to put this in perspective. The rest of the nation is buying textbooks that meet standards set by a state whose students are not even close to the best performers in the nation. Some additional articles in the local paper. Saddleback abomination. Religious test for office. Homophobia on parade. Supreme misunderstanding. 5:20 Ernie Chambers 2nd appearance; discusses his case against god; omnipotence & omniscience precludes service. the case was brought specifically because courts should be open to any body for any reason (the way the law reads in Nebraska) he goes through a few of the counts against god listed in the lawsuit. 18:40 Catha Pollitt, flocking to faith; Obama’s complete betrayal of the constitution, with his announcement to continue the faith based initiative. She qualifies her bile with her intention to continue her support for Obama. I find this blind subservience to any political faction sad & disgusting. 5:15 theocracy alert. Texas pledge modification (how about no pledge? My children do not pledge) David Vidder, latest conservative hypocrite. Bill Moyers’ religious judgment error with Martin Marty. God’s warriors. 20:30 Ed Buckner has a chapter in Everything You Know About God is Wrong. America is not a christian nation. To some of us, this is not news. Decent interview all the same. Larry Lerner representing the Fordham Foundation and the report he co-wrote www.edexcellence.net on science standards in the classroom. The discussion revolves around the problems of setting and maintaining education standards, and the evolving nature of creationism. Mike Smith sponsored a billboard in downtown Denver. Hats off to Mike. Now we need a sponsor for I-35 in Austin. Any takers? Confession. I had nearly given up on reviewing Freethought Radio, until I heard this episode. Michael Shermer’s book “Why Darwin Matters“ was a CATO event which I reference whenever I get into an argument with ID supporters (there’s also the Mind of the Market event) but really, I was just impressed that Dan and Laurie reached outside of their comfortable progressive group and found someone new to talk to. The subject of Expelled was a prominent discussion point in the interview. My thoughts on that worthless film are here. Micheal Shermer’s review is here. The episode opened with discussion of the ARIS poll and Harris Polls that show a marked decline in religious belief and attendance. I personally like the interactive features at The Pew Forum on Religion & Public Life. No matter how you slice it, though, there’s no arguing that the US is becoming less concerned with religion. Which probably explains why the Southern Baptists featured in Theocracy Alert sound so concerned. I actually listened to this episode a year ago because Catherine Fahringer is from Texas and I wanted to hear the views of a fellow Texan. I was surprised to hear that there was a chapter of FFrF in Texas. They certainly don’t have a web presence. The story of the German freethinkers slaughtered by Confederate forces was news to this Texan; or that there was a memorial to them in Comfort, Texas. (separate from the Nueces Massacre “Treue der Union” Monument) Time for a freethought pilgrimage? Dan’s Lucifer’s Lament closes out the episode. Paraphrasing Susan Jacoby; It really doesn’t matter what the beliefs of the founding fathers were, what matters was what they put in the founding documents. There is no god in the Constitution; and the ‘creator’ referenced in the Declaration is nothing more than a nod to nature as the creator. Those of us who have been wandering around in Libertarian circles for the lat 15 years are reasonably familiar with these facts. Now, the story of Robert Green Ingersoll (the second half of the interview) is something you wouldn’t know about unless you have been looking into the history of disbelief. You certainly wouldn’t have stumbled across his name in school in modern day America, the devout have exorcised him from the history books. The final segment gets into the part of the interview that I find most interesting. Why are you a non-believer? The varying stories of how and why a person comes to “lose faith in faith” just seem to hold my attention. The episode finishes up with a rendition of Die Gedanken sind frei. The Other Shoe Drops; Will Evolution be Next? McLeroy’s latest antic — though I would call it the first shot fired in a war, a war on reality — was over, of all things, the English standards. According to an article in the Dallas Morning News, teachers and experts had worked for two and a half to three years on new standards for English. So what did McLeroy do? He ignored all that work entirely, and let “social conservatives” on the board draft a new set overnight. “Mr. Chair you’re going so fast … you’re moving so fast we can’t find it in the other document,” [board member Mary Helen] Berlanga said, shortly after the page-by-page explanation began. After more complaints, McLeroy declared that he would continue at the fast pace. “The ruling is you’re being dilatory in dragging this out,” McLeroy said. The board voted to approve the hastily cobbled-together standards, 9-6. And if you’re not tired of guessing, then guess what discipline comes up next for review? Science! Every time you pet your dog, you are touching a known product of evolution. Through thousands of years of companionship, we have created the creatures that lovingly chew our sneakers and pee on the rug. God didn’t create dogs, humans evolved them from wolves that were captured and tamed. This is a concept so obvious, most people don’t even notice it. The current chairman of the Texas Board of Education is one of these people. He is a creationist, bent on introducing Intelligent Design into Texas classrooms. He needs to be ousted, and yesterday wouldn’t be soon enough. There is no room for creationism at the science table when it comes to teaching children. Leave it at church where it belongs. Send a message to the powers that be this year, tell the TEA hands off our science curriculum, send the fundamentalists packing. I have, and I will again. Either the state concedes on this issue and removes the sitting board chairman, or Texas spends millions of dollars defending itself against lawsuits as outraged parents take the state to court over curriculum that they refuse to see taught to their children. Here’s an interesting coincidence. The Governor’s contact page seems to be terminally on the fritz. That’s odd. I know I’ve used that contact system before. I wonder if he’s feeling the heat from his extremely unwise choice of SBOE chairs. One can only hope. Author ranthonysteelePosted on May 26, 2008 Categories Politics, Religion, ScienceTags Evolution, SBOE, SchoolLeave a comment on The Other Shoe Drops; Will Evolution be Next? If only Ben Stein read newspapers. You can chalk this up as another nail in ID’s coffin, no matter what Expelled has to say on the subject. Expelled quotes Charles Darwin selectively to connect his ideas to eugenics and the Holocaust. Ben Stein’s speech to a crowded auditorium in the film was a setup. Scientists in the film thought they were being interviewed for a different movie. The ID-sympathetic researcher whom the film paints as having lost his job at the Smithsonian Institution was never an employee there. Science does not reject religious or “design-based” explanations because of dogmatic atheism. Many evolutionary biologists are religious and many religious people accept evolution. I could go on, but the subject of factual dinosaur evolution is more interesting than belief systems that have proven to be erroneous; otherwise I’d be gushing about Jurassic Park right now, which has it’s own baggage of belief (or Disbelief) to carry, and is far more interesting than the subject of Intelligent Design. I should give a nod to Michael Crichton for introducing me to the concept of birds evolving from dinosaurs. Proves the value of reading widely, especially in the SF field. 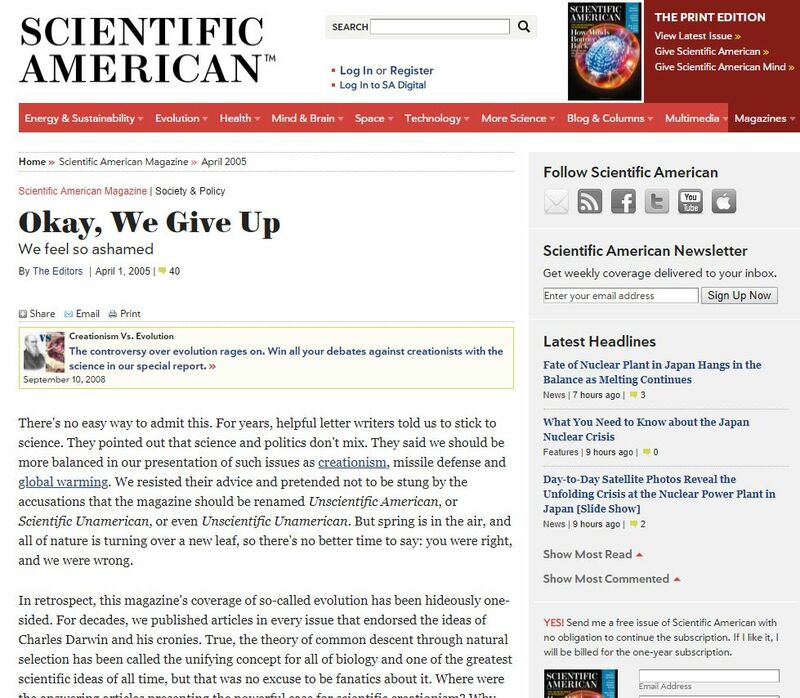 As the release hype for Expelled heats up, a little reminder of the dishonest methods used to get interviews from evolution supporters. Why were they so dishonest about it? If Mathis had said outright that he wants to interview an atheist and outspoken critic of Intelligent Design for a film he was making about how ID is unfairly excluded from academe, I would have said, “bring it on!” We would have had a good, pugnacious argument on tape that directly addresses the claims of his movie, and it would have been a better (at least, more honest and more relevant) sequence. He would have also been more likely to get that good ol’ wild-haired, bulgy-eyed furious John Brown of the Godless vision than the usual mild-mannered professor that he did tape. And I probably would have been more aggressive with a plainly stated disagreement between us. The article goes to the detail necessary to prove that he (and others) were tricked into participating in a film different from the one they had agreed to be interviewed for. Having now been accosted on several occasions by the obnoxious mug of Ben Stein on Science Channel programming that I just happened to be watching (although I’m not quite as militant about it as the Bad Astronomer is, I do agree with his sentiment. I’m not surprised though. Watching The History Channel for any length of time removes any illusions about what kind of history is important there) I decided to track down more on the subject of this pro-ID propaganda piece. Suffice it to say, I won’t be paying to see this film. If I do see it, I’ll be watching it in much the same way I saw Sicko, another propaganda piece not worthy of a monetary investment. It just about equates on the reality meter. Ben Stein is an ignorant fool.